How Did a Train Leave Without an Operator? The MBTA is coming under fire after a Red Line train traveled from Braintree to Boston Thursday morning without an operator. "These things aren't supposed to happen," said Paul Regan of the MBTA Advisory Board. Regan says MBTA trains have redundant safety systems. "Positrain" control is computer software that automatically shuts down a train before it crashes into another. There is also the dead man's switch. "Literally, it is a switch that the driver leans on to make sure that that there is actually someone running the train," said Regan. It's supposed to be a failsafe, and yet, this train took off. "It's not supposed to be possible," said Regan. He says if someone tampered with the switch - for example, if the operator wedged something into it like a pen or tied something around the lever to jam it into the forward position - it would imitate the presence of a driver and the train wouldn't know the operator had stepped away from the controls. 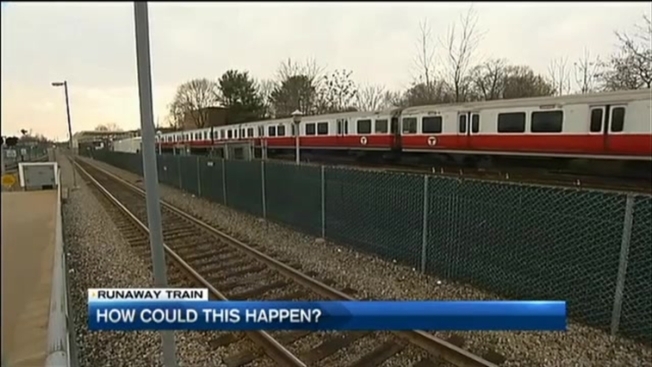 "It's absolutely forbidden by the MBTA," said Regan. "This is a major, serious safety violation." Regan says he does not know why the operator would do that. "It doesn't make driving more difficult," he said. "It's not something you would do for convenience. It's inexplicable at this point." State officials say the operator was given permission to leave the train, but operators are supposed to apply a full-service brake and a hand brake before getting off. It's unclear if that happened, but Regan said the final back up did happen, MBTA officials were able to shut down the third rail to keep the train from moving from its high-tech control center in Boston. "They were able to recognize that a train was not operating normally and address that situation before it got any worse," Regan said. Though the T did shut it down, the train ran without an operator for nine minutes. The incident is being investigated by the MBTA police, Public Safety and the Federal Transit Administration, but officials from the National Transportation Safety Board say they are declining to investigate.